A massive solar storm may spark an intense northern lights display for skywatchers at high latitudes tonight and Thursday (March 8) as a wave of charged particles reach the planet. 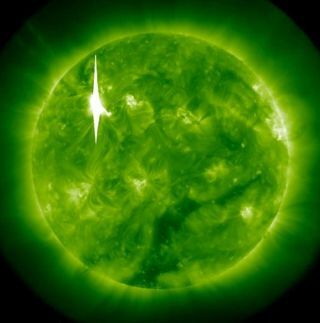 Two huge solar flares erupted from the sun late Tuesday (March 6), triggering one of the most powerful solar storms in more than five years. The solar tempest is expected to intensify aurora displays (also known as the northern and southern lights) on Earth, according to space weather scientist Joseph Kunches, of the National Oceanic and Atmospheric Administration (NOAA). "Auroras are probably the treat that we get when the sun erupts," Kunches told reporters today (March 7). One of the big sun flares unleashed a cloud of solar plasma and charged particles, called a coronal mass ejection (CME), into space. While the CME is not expected to hit Earth directly, the wave could deliver a glancing blow to the planet. As the energetic particles impact Earth's magnetic field, aurora displays could be amplified for well-placed skywatchers around the world. A bright, nearly full moon will also be competing for dominance, but provided the weather is clear, lucky skywatchers could be treated to spectacular aurora displays, Kunches said. Still, auroras are not the only byproducts of solar storms. In fact, powerful flares and resulting CMEs can set off geomagnetic and solar radiation storms. Geomagnetic and solar radiation storms sometimes have the power to disrupt communications and power grids on Earth, and interfere with satellites in space. "There is the potential for induced currents in power grids," Kunches said. "Power grid operators have all been alerted. It could start to cause some unwanted induced currents." Airliners with routes that fly over the polar caps could also experience communications issues during this time, and some commercial aircraft operators have already taken precautionary actions, he added.